all others are placed in 256Kbps through marking the whole subnet (/29). Make sure the passthrough. Youtube traffic simply matched through content of the packet . It will match the whole session traffic. we can see if all the users download in this situation ( except youtube) the total bandwidth goes 1.5Mbps but since the max-limit for 512K users 512Kbps they will equally share the bandwidth 256Kbps but if one user not downloading other user will get 512Kbps full. but if the max limit is 768Kbps both users will devide the bandwidth equally but at the same time 256Kbps user will get 128kbps each. In this scenario (max-limit 512kbps & 384 for youtube) when 4 usrs downloading & one user goes to youtube he will get 384Kbps and remaining bandwidth 640Kbps will be available for other users. loweset priority queues will starve (0 kbps will be allocated) . Do some math before allocating bandwidth & priority. 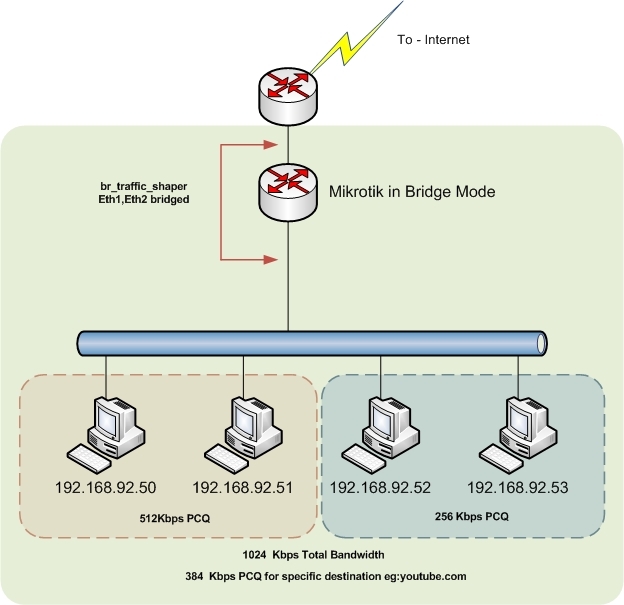 how can you give priority to msn messenger on mikrotik. that way it doesn't slow down or lag. New to mikrotik and not a fan of codes. But I need to know the process of how to set up a queue. Either simple or a queue tree. I want this queue to have the following behaviour on my network. 1. Give fair bandwidth usage to all users currently on network (Users can vary at times...this is a cafe wifi hotspot connection). "We are Currently using a 260kbps (kilobyte per sec) connection." 2. 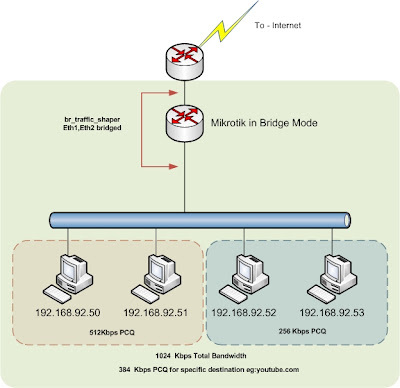 Give priority connection of 65kbps to specific computers (I dont know how mikrotik marks computers. Maybe using MAC addresses). This will be used to give admin computers priority connection. Please I just need the scripts or strings to input into my mikrotik winbox. Would be extemely grateful if this can be done as it would give us an easier time installing more base stations.